Easy to Install, even Faster to Set Up, Integrates to on-site or Hosted SIP Servers. Huge Certification, 36 Manufacturers. The VoIP Gate Intercom System is designed specifically for IP Phone Systems. The product is SIP compliant and certified by all leading IP Phone System Vendors. Its installation is simplistic and hassle free. The configuration is even easier. See the full interoperability list here. It features an integrated dry relay contact for Auxiliary control. The Normally Open (N/O) contacts of the board, act as a direct drive and trigger the automated Gates controller unit. There is no need to procure or install an external relay. This makes the easy install even easier. In this post we are going to explain how the VoIP and SIP Gate Intercom installs to a Network. We are also going to demonstrate how the VoIP Intercom forms part of the End Users SIP Phone System. If you are looking to control the VoIP gate Intercom from a centralised location, we have got the covered. The device features an embedded vLAN protocol, for Virtual Networks. This is a well made product, designed and built in California. We (iEntry Systems, are the Authorized Distributor). We have locations in the UK and the USA. We ship to and support a global network of SIP based Secure Entry Installers. Direct Certification from Avaya, Alcatel, Broadsoft, Cisco, NEC, Mitel to name a few. Jump Straight to the Product ? The letters IP to your traditional security installer, can still be quite alien. Throw SIP and VoIP into the equation and you could be overcome with a little fear and lack of knowledge. The fact is, VoIP is huge now. 10 or 5 years ago, this conversation may of been a little different. End Users establishments and new builds DO NOT deploy old analogue PBX systems. They install VoIP, it’s feature rich and reduces total cost of ownership. Plus with hosted solution, you don’t even need hardware on-site. External article here on the features of VoIP. All new builds now have IP Phone systems. Furthermore, lets not forget the huge market that is upgrading from legacy telephony to VoIP. We get many calls from End Users who are finding their 2 wire analogue door and gate intercoms redundant. Finally, throw into the mix, the multi billion pound fibre roll out, by the Government and BT. VoIP will only continue to grow and dominate the telephony market. This really is though, a very easy and simple installation. The VoIP Gate intercoms architecture and protocol, is an advanced one (SIP and VoIP). Yet the heart of the installation and the most technical aspect, is wiring the on-board relay (I/O board). The great news is, this is the same electrical relay, that traditional security installers have been working with for decades. ^ Plug a Cat5e Cable Into its RJ45 Port. Then back to a PoE switch. Easy ! You, the installer need to mount the VoIP based Gate Intercom to a Goose neck mount. You could also flush mount the product, to any flat surface. The Intercom has rear and side cable entry points. Once installed to your gate entry points, plug a cat5e cable into it’s RJ45 port. Then run the other end of the Ethernet cable back to a network point. With PoE connectivity you can power the intercom with the same data cable used for it’s network connection. Anyone could do that right ? Once connected to the network, the Gate Intercom System will play its IP address over its Speaker. Type this into a web-browser (Safari, Internet-Explorer, Chrome or Firefox). This is where you connect the Intercom to the IP Phone System. We have made a video to demonstrate this below. Your End User will know his/her IP-PBX (SIP Servers) details. Click on the SIP config, and enter your details. You could even ask the End User to do this part. It takes under five minutes to configure the settings. This article is concentrating on the Single Call Button VoIP Gate Intercom. This is the most popular VoIP Gate Intercom we sell. However, there is a 12 Key Keypad alternative. So what can you do with the Keypad version ? The Single Call Button Intercom would dial a single SIP extension. This would place a call to one IP Phone and Desk. However, that single call could form a hunt group and dial multiple extension numbers. Telephone Operation: Dial an unlimited number of extension numbers within the building. Speed Dial Operation: Similar to the Call Buttons operation, set up to 13 keys to SIP extension numbers. You can see the Outdoor Keypad VoIP Intercom here. 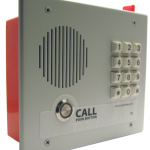 As mentioned above, the IP gate intercom features an integrated relay. By default, this features Normally Open (N/O) contacts. This will drive the mechanics of the Gate controller. Within the “Device” Config settings, you pre set a DTMF Relay Code. Dual Tone Multi Frequency are the tones and signals our phones send when we press a button. The relay is compliant with the standard approved DTMF delivery, which is RFC 2833. 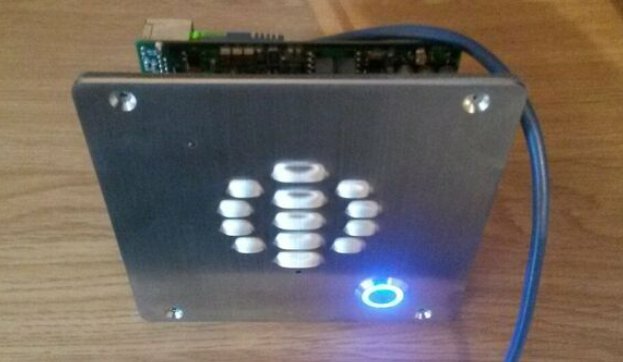 Our VoIP Gate Intercom does not require any special apps or software. Let’s say for example, you set 8801 as the Relay activation code, the person at the gate the presses the call button. This would place a call to your extension or hunt group. With vLAN settings, this could call a central and remote location. You could also reach a mobile phone (within your hunt group). The End user would then press 8801 (on their IP or Mobile Phone) then the Gate would open. The VoIP Gate Entry Phone has passed interoperability testing with 36 IP Telephony Manufacturers. Any Manufacturer that is on the list, has been involved with the approved status. Some manufacturers directly certify the product. These include Broadsoft, LG IPECS, Cisco, Mitel, NEC to name a few. You can see the full Interoperability Page here. 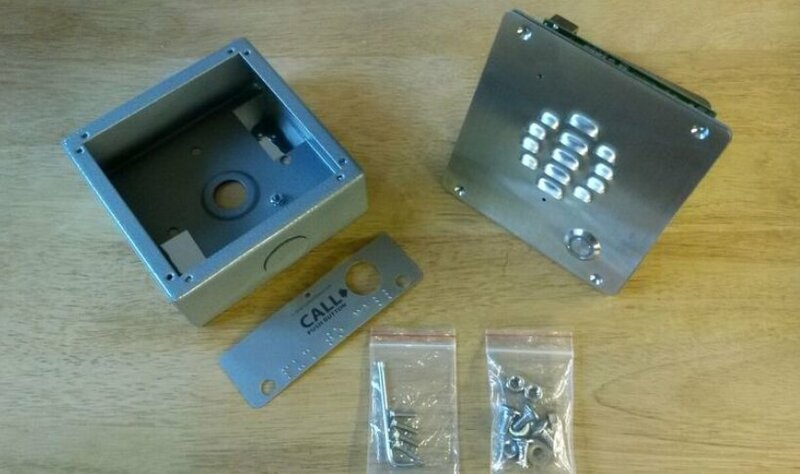 Working on your own VoIP Gate Intercom Project ?